Actress, talk show host and queer heroine Ellen DeGeneres returns to her stand-up roots tonight with her new Netflix special Relatable. Given that we love Ms. DeGeneres in any form, we can’t wait to watch her hit the stage with her characteristic wit and wisdom. Thus, in preparation for Relatable, we humbly submit these moments Ellen wowed us—and just about everybody else—with her Ellen-ness. Relatable hits Netflix December 18. With the release of Star Wars: The Force Awakens pending, Ellen invited one of her favorite guests to the show for a little celebration. When Carrie Fisher arrived, she and Ellen donned Princess Leia wigs and did a segment flagging down cars outside her studio in Los Angeles. They delighted those who stopped with tickets to the film and the rest of us with the sheer absurdity of it all. 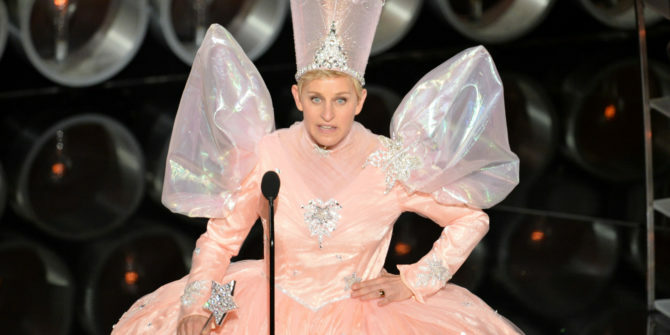 Ellen’s second stint hosting the Academy Awards made for one of the most entertaining Oscar broadcasts in history courtesy of her sheer mania. At one point she dragged a real pizza delivery man on stage and began passing out slices to the crowd. We still can’t get over the image of Martin Scorsese and Meryl Streep charging to grab a bite or Ellen panhandling the stars to collect enough cash to pay for it all. Ok, we have to admit–and we feel a bit bad for doing so–that we kind of love Ellen scaring the crap out of people on her show. Picking just one moment is tough, though, without question, we still love the time she nearly made Richard Simmons lose bladder control. “I almost died,” said Simmons. We definitely did. Ok, sentimental alert. We can’t help but mention that time she appeared on the cover of Time with the caption “Yep, I’m Gay.” Ellen’s coming out trumpeted the arrival of a new era in LGBTQ rights and visibility, and she risked her career to herald it. We will forever express our gratitude, and our awe: she killed us with courage. NO AUDIO on any of the clips.